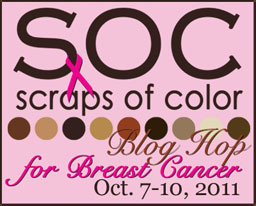 Royal Scrapbooking Club©: October 7, 2011: Scraps Of Color Breast Cancer Awareness Blog Hop! October is Breast Cancer Awareness month! So, in honor of this event--I, along with some talented crafter's, have teamed up to honor and celebrate the men and women in our lives that inspire us with their strength in the battle against Breast Cancer. 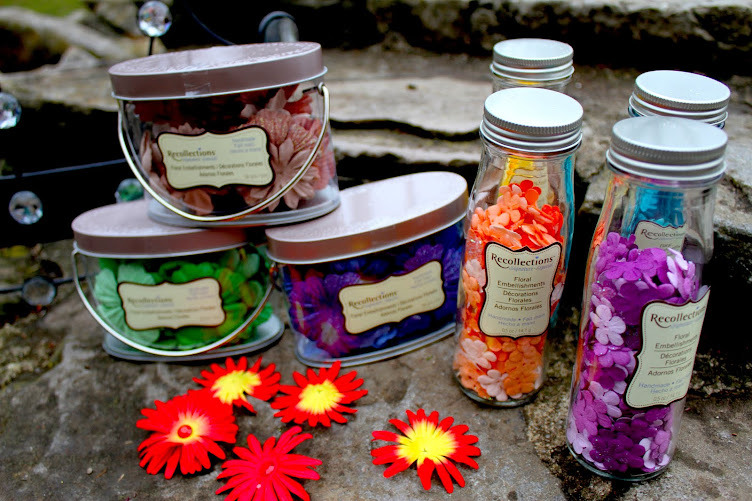 Of course, a blog hop isn't complete without blog candy! There will be giveaways on various blogs throughout the hop! Plus, there will be an SOC blog hop gift awaiting one visitor!! To be eligible for that prize, you must comment on all the blogs by Monday, Oct. 10 at 11:00pm EST. The fight to find a cure for breast cancer is near and dear to my heart. Not only because my maternal grandmother lost her battle with breast cancer; but because my mom had a scare a few years ago. In 2009, the Lord healed me from ovarian cancer. To God Be the glory for the things he has done. I give him praise for healing me and for the courage and hope that i received from my mom and my grandmother. Yes, Lord we need a cure. My prayers and support go out to all of the women and men who are still in the fight. Do what you can, you may not be able to run or walk for a cure. You may not be able to donate money or time; but buy the pink labels whenever you have a choice. Do what you can. But above all, PRAY. I love to do 12x12 pages with lots of accents. Recently I’ve began creating over-sized tags in order to make better use of my printed pager. As you know most of the nicer printed paper, BasicGrey, 7Gipsies, K&Company, etc, are sometimes $.079++ per sheet. So, my answer is to tear and cut the paper to make it last. Below are 3 similar over sized tags. They each include the same pink Brazilian textured cardstock, paper studio printed paper and ribbon, and glitter glue is from the dollar bin at Michael’s Crafts. One of the major advantages of these large tags are the ability to incorporate special quotes that accent your photograph or further explain what your layout or photograph is about. The theme of these tags are to promote Breast Cancer Awareness (BCA). The center of the flowers were kinda plain so, I used a lime green glitter paint from the dollar bin at Michael’s crafts. The glue is close to the color of the center of the flower. The sage and pink mats bring out the green glittered flower centers. I also use Pop Dots by ALL NIGHT MEDIA. I LOOOOVE Pop Dots. The dots are used pop up the 2nd word block and smaller dots cut in 1/3's are used to pop up the pink ribbon of hope. The ribbon is from the Paper Studio ribbon collection. Can you tell how much I like the product and supplies from Hobby Lobby? I did not want to go "too" pink with so I decided to ink the white background in the title blocks with walnut colored pigment ink. The ink was also used on the 2nd title block. This was done with all three examples. I'm sure you agree that a little ink on the edges help in toning and blending the mats. Shhhh, don't tell but I do the same thing to cover my gray hairs. 2 thumbs up for Design Essentials and my beautician. A Martha Stewart punch was used to add more definition to example 3. The walnut colored ink was perfect with the ivory colored word blocks. The butterfly is from the Cricut Storybook cartridge and the pink blink is from Say it with blink distributed by Want2Scrap. All thee designs have the butterfly as the focus because nothing says hope like a butterfly. Thank you for visiting the Royal Scrapbooking Blog. These are so pretty! So much detail! Very encouraging! The card is so beautiful! Love it! Adorable! I'm a Pink Girl! As a survivor, I thank you so much. Thank you sisters for visiting. Love the pink and the unique size. Very unique idea and pretty tags. Very nice tags! I love the larger size--could see lots of uses for these! Thanks for participating in the hop! Totally agree that we can all offer prayer...because it's free and is the most powerful source! Thanks so much for the reminder and for sharing your pretty tags! Your tags are absolutely beautifully detailed! I'm thankful for your explanations of each. I am praising the Lord for your healing & so glad to know your Mom is now doing well after her scare!! So sorry to hear of the loss of your Grandmother. Best of Health to you. cool tags. Great ideal for the hop! Wonderful Idea and beautiful, too! Blessings to ya! I like your unconventional tags. I'm goig to make some when I get home!! The tags are great. I like the cheerfulness of them. Your tags are beautiful! Thanks for the inspiration!!! Beautiful! You've inspired me to give them a try!